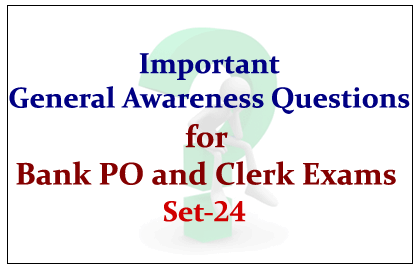 The List of Important Expected GK Questions for Upcoming Bank PO and Clerk Exams was given below. Candidates those who are preparing for the examinations can use these questions. 1).Which of the following statement is correct with respect to buying and maintained an insurance policy? 2)._______ Act, 1972 was passed to nationalize the entire general insurance business in India? 5).Which term is used for the banking service that is provided to unemployed or low-income individuals? 6).Which is NOT covered under general insurance? 7).Which of the following non-life insurer is nonexistent in India? 8).The Insurance Regulatory and Development Authority of India (IRDAI) comprises a 10-member team consisting of a chairman. ___________ is the present chairman of IRDAI? 9).Who is the author of the book- “Dramatic Decade: The Indira Gandhi Years”? 10).Every year 30th January is observed as _______.